Mysteries don't solve themselves, or do they? Sometimes a good detective can make a mystery unravel itself in the most peculiar of ways; coincidence or clue? Perhaps both? in Dirk Gentky's Holistic Detective Agency: Everything is Connected, holistic detectives compete with the police to solve the most vexing of mysteries using an ever-changing set of clues, suspects, and person of interest cards. 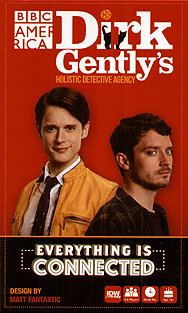 Dirk Gently's Holistic Detective Agency: Everything is Connected is a social story telling game where two players appeal to a panel of their peers in an effort to make the strongest case for whodunit and how?